The Utah Jazz are showing once again why they are arguably the model franchise in the NBA. Just like the Pittsburgh Steelers in the NFL, the Jazz have a culture of stability and loyalty along with a rabid fan base that has allowed them to remain competitive year-in, year-out. A nearly three-month stretch of strong play has catapulted the Jazz into in a four-way tie with the Mavs, Nuggets and Suns for the second best record in the highly competitive Western Conference with five games remaining. The formula that has gotten the Jazz to this point is a familiar one: pick-and-roll offense supported by good perimeter shooters, disciplined half-court defense and a significant home-court advantage. While Deron Williams and Carlos Boozer have replaced Stockton and Malone, the style of play remains remarkably similar. With the exception of Boozer, many of the Jazz’ current players are draft picks, including star point guard Williams. The Jazz’ judicious talent evaluation is particularly important in a market that makes it tough to attract high profile free agents. 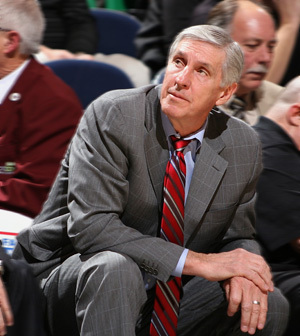 At the heart of it all as always is Head Coach Jerry Sloan. Sloan is now in his 22nd season as head coach, by far the longest tenure with one team of any coach in NBA history. His principled, no-nonsense manner has earned him high praise and respect from not only within the organization, but also across the league. Sloan was a hard-nosed player himself before moving to the coaching ranks, and that nature is very much reflected in his teams. He is still in search of that elusive championship (thanks in large part to Michael Jordan), but Sloan is that rare breed in professional sports who does not need rings and trophies to validate his career. His unerring approach to life and the game has already earned him the distinction of being recognized as one of the great coaches of the modern era. Deservedly he was inducted into the Basketball Hall of Fame in 2009. The Jazz are playing very well right now, and will be bolstered by the return of Andrei Kirilenko from a calf injury. The play of Kirilenko and Mehmut Okur in support of Williams and Boozer will be critical success factors for the Jazz in the playoffs. While this team may lack the overall consistency of the rock-solid Stockton and Malone teams, it is still a team nobody wants to play, particularly in Salt Lake City. And if they get hot, the Jazz could easily make a trip to the Finals. Came across this site by chance. We are long time fans from the Atlanta Hawks days, though you may not remember. We also ran into you once in Milwaukee when the Hawks had a game. You generously provided tickets for us to the game and it was the highlight of our trip. We hope all is going well, Michael. Great to hear from you Jay. Hope you and the family are well. Things have been great for me in the world of TV. And now I’m getting introduced to a whole new world in cyberspace. Thanks for tuning in. Hi, Mike! Thanks for the article on the Jazz. I have been a rabid Jazz fan since I was a kid. I was at the game when Michael Jordan supposedly had the flu and ended up beating the Jazz, and he and his Bulls ended up taking the big trophy home. It was tragic, but still, great memories of Karl and Malone, and now we have one amazing point guard, arguably the best this season, in Deron Williams. Anyway, thanks for the article. By the way, I love it when you are on TNT with Reggie Miller. You two are a crackup. Take care! 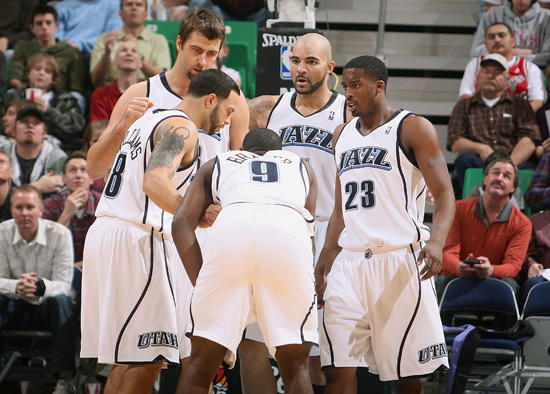 mike, one questinon: why do you think the jazz are so inconsistent? Oftentimes a team’s chemistry can be thrown off-balance due to a key injury. This problem will be compounded if the team’s schedule is particularly challenging – for example if they face a long stretch of away games or matchups against top teams. You need everybody active and healthy in order to win consistently. Appreciate you all following the website. Turns out I’m headed to Denver for the TNT broadcast of Jazz at Nuggets Game 2 on Monday 4/19 at 10:30 PM ET. Tough break for Utah losing Kirilenko.